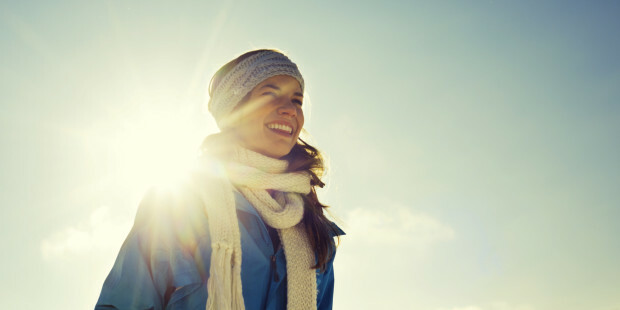 Do I need to wear an SPF, even in the winter? When we hear the letters “SPF”, we automatically think of summer holidays, golden sun tans and the smell of coconut coming from our oily, frazzling skin. We all know about using SPF as a protection against UVB rays, the rays that can burn our skin. But, the aging effects we see from the sun such as leathery skin, lines and wrinkles and dark spots are a direct effect of UVA. UVB (B for Burning) is a very visible ray on light spectrum and our senses recognize it. We can see the sunshine, we can feel the heat on our skin and can watch our skin change colour and so know to apply SPF. The sun tan lotions we know well, are the over the counter products we buy from high-street stores and supermarkets. They are thick, oily or chalky and can mean some of us can have a reaction, such as sensitivity or prickly heat. So the idea of wearing a sun tan lotion in the winter, underneath our make up doesn’t sound necessary, or appealing. The truth is, most of the cheaper, high street sun tan lotions are just that, lotions that protect you from a suntan. They protect us from UVB and offer very little protection from UVA. UVA (A for aging) is a deeply damaging ray on the light spectrum that is in ALL day light. We can not see or feel the effect of UVA on our skin, yet up to 49% of UVA rays penetrate to the deeper layers of our skin. Whereas UVB only penetrates the top layers of skin, UVA reaches the nucleus of our skin cells that hold our DNA information. If we get DNA breakdown in our skin cells, we see weakening of the skin causing lines, wrinkles and sagging skin and aggravate skin conditions such acne and rosacea . UVA rays can also penetrate our melanocytes, the cells in our skin that make our pigment. If these cells get damaged they can over produce pigment giving us uneven skin tone, pigmentation and sun spots. UVA can travel through window glass and even reaches our skin, if we are sat indoors. So whether you work outdoors or in an office, UVA protection is essential, everyday. There are two types of protection from UV radiation. Chemical SPF is the main protector against UVB, they let the rays into the skin, transfer it into heat, and kicks it back out again. The molecules of chemical SPF are oily or chalky and thick, this means the skin can’t breath and we can get spotty skin or heat rash. Physical SPF protects us against UVA are the molecules are like snowflakes made of mirror. They over lap on the skin and bounce the sun rays off the skin while the tiny gaps in the flake like structure allow our skin to breathe. Don’t be fooled into thinking you are getting enough protection from foundations and over the counter moisturisers that contain SPF. They are often chemical SPF’s and wont give you the anti-aging protection you need. A broad spectrum SPF will contain both physical and chemical protection ingredients. A cosmeceutical SPF will contain very high levels of physical sun protection ingredients, such as Zinc Oxide and Titanium Dioxide. These ingredients will be complimented with stem cells, anti-oxidants and hydrators that make them silky and light on the skin, as well as offering extra protection again DNA damage and photo damage. The idea that our skin cell DNA is breaking down causing aging and aggravating our skin conditions every time we are in natural day light, can trigger a mild panic, and make us want to protect our skin as much as we can. This can often lead to a desire to wear an SPF 50. But 30 is plenty is you are wearing a broad spectrum SPF with added protection such as Stem Cell technology. The increase in protection between SPF 30 and SPF 50 is less than 1%. These broad spectrum, SPF 30+ products can be a little more expensive, but are worth every penny, when you realize the benefit of protecting your skin long term. If you are undergoing ANY kind of Clinical facial treatment such as microdermabrasion, chemical peels or laser, a broad spectrum SPF is essential and a good clinician will not treat your skin without you purchasing their own SPF or signing a disclaimer to say you have one and will use it every day. This is because resurfacing treatments leave your skin temporarily even more vulnerable to the effect of UVA in day light. All image clinical practitioners are thoroughly educated in the effects of UVA and UVB and our Prevention + of SPF moisturizers that are jam packed with exceptional ingredients to maximise the protection of your skin. Whether you like a dewy finish or a matte effect on your skin, there is something in the Prevention + range you will love. Ask your Image Clinic for your prescription of SPF today.